So much of the 1993 thriller Judgment Night has had the same staying power as Jeremy Piven’s natural hairline—everything that is, save for the soundtrack. Like the film, it’s a story of clashing cultures: Emilio Estevez’s gang of suburban dads battling Denis Leary’s gang of criminal stereotypes on screen; “alternative” rockers backing hip-hop artists on tape. But far more people took notice of the album, with the team-ups between Onyx and Biohazard, Helmet and House Of Pain, et al. presaging the sort of pummeling, puffed-up rap-rock that would dominate radio for the rest of the decade. 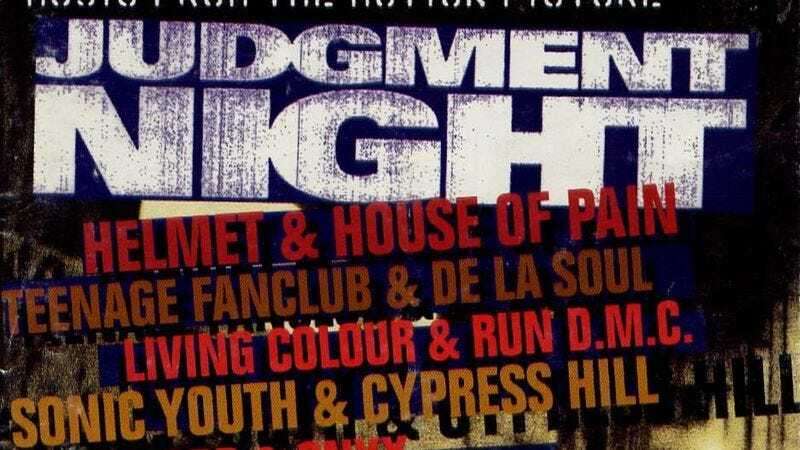 Even today, the Judgment Night soundtrack remains a fascinating, fondly remembered artifact of mid-’90s America—far more so than Stephen Dorff. While pairing Onyx’s gruff shouting with Biohazard shouting gruffly is hardly an exercise in musical alchemy, the Judgment Night soundtrack also featured some genuinely weird meet-ups that wouldn’t have happened anywhere besides backstage at Lollapalooza (or that Lollapalooza Simpsons episode). Among them was “I Love You Mary Jane,” a song that Cypress Hill could have—and probably did—write in its sleep, but that here it had to fashion from the alien noise of Sonic Youth. As DJ Muggs recounted for Complex, the Judgment Night session was Cypress Hill’s first time in a studio with an actual band, and it’s hard to imagine a more baffling introduction than watching Thurston Moore bend and scrape his guitar strings and emit laser-gun peals of distortion. They probably just wanted to lay down a drum machine and some lyrics about weed and go home. Still, as Muggs tells it, “Then Kim killed it with that hook”—Gordon’s “Sugar come by / And get me high,” which creates the song’s spacey, lost-afternoon vibe—and “then B [Real] kicked his thing,” and suddenly it all came together. The result is a sum that’s much greater than its parts: B Real’s pot paean is as boilerplate as it gets, and Sonic Youth’s usual eye-of-the-storm experimentalism is reduced here to a single, springing guitar sound under Gordon’s breathy whisper. But together they create a groove that’s as tasty—yet just slightly off—as a weed brownie. Also like a weed brownie, it’s almost a shame to waste it on Judgment Night.